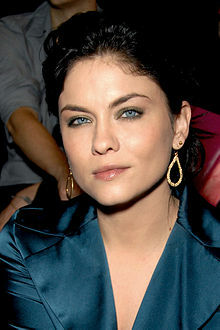 Jodi Lyn O'Keefe (born October 10, 1978) is an American actress, model and fashion designer. She came to prominence for her portrayal of Cassidy on the television series Nash Bridges (1996–2001). She is also known for playing Gretchen Morgan on Prison Break (2007–09), and for her roles as Jo Laughlin on The Vampire Diaries (2014–17) and Lionel Davenport on Hit the Floor (2014–18). Her film credits include Halloween H20 (1998) and She's All That (1999). O'Keefe was born in Cliffwood Beach, New Jersey, the daughter of Noreen, a homemaker, and Jack O'Keefe, a director of labor relations for Merck. She has Czech, Irish, Polish, Swedish and Austrian ancestry. O'Keefe has two older sisters, Jenna and Heather. O'Keefe started her career as a model at the age of 8 years old, and she did some modeling work for a Jeans company. Midway through her junior year of high school, O'Keefe left school to star on the soap opera Another World, playing Marguerite "Maggie" Cory. She then got a role on Nash Bridges playing Cassidy, the daughter of Don Johnson's title character. She and her mother moved to Hollywood so O'Keefe completed her schooling by mail. O'Keefe made her big screen debut in 1998 in Halloween H20: 20 Years Later and later starred in such films as The Crow: Salvation, Whatever It Takes and Devil In The Flesh 2. In 1999, she co-starred in the teen film She's All That (1999) as Taylor Vaughan alongside Freddie Prinze Jr. and Rachael Leigh Cook. When asked if it was hard to play her character, a high school prima donna, she replied, "Everybody knew a Taylor Vaughan in high school. Working in show business, you meet girls like that every day." O'Keefe kept on filming both movies and Nash Bridges until the series ended in 2001. Later films have included Out for Blood, in which she played a vampire named Layla Simmons and Venice Underground. On the small screen, she has appeared in various shows including Dharma & Greg, Boston Legal, Two and a Half Men, Charmed, The Evidence, The Big Bang Theory, and Tru Calling. In 2007, O'Keefe was cast in a starring role on the series Prison Break; she was a part of the show's cast through its third and fourth seasons. O'Keefe has said that she "truly loved" playing the part of her Prison Break character Gretchen Morgan, because it "challenged" her, and because Gretchen was the "polar opposite of her" and "was badass". In 2014 O'Keefe was cast in a recurring role in VH1's TV series Hit the Floor, and appeared in the film Merry ExMas. The same year, she was also cast in the recurring role of Jo in the sixth season of The CW series The Vampire Diaries. In 2009 she appeared in the stand-alone add-on of the video game Command & Conquer: Red Alert 3: Uprising. In June 2013, O'Keefe did a photoshoot for NOH8 campaign. O'Keefe was in 3 Doors Down's video for "Let Me Go", alongside Jesse Metcalfe of Desperate Housewives. On June 22, 2011, O'Keefe started her own clothing line, Queen George Clothing. In 2012, O'Keefe launched her own jewelry line, Q.
O'Keefe is also a licensed bounty hunter together with her friend Victoria Pratt, with whom she starred in the movie A Nanny's Revenge. In 2005, she played Isabella in an episode of Two and a Half Men. 2002 Dharma & Greg Simone Episodes: "She's with the Band", "Mission: Implausible"
2002 George Lopez Campbell Episodes: "Who's Your Daddy? ", "The Wedding Dance"
2004 Tru Calling Candace Aimes Episode: "Reunion"
2004 The Help Becky Wiggins Episode: "Maggie Chicken"
2004 Charmed Spider Demon Episode: "Spin City"
2004 Two and a Half Men Gail Episode: "Last Chance to See Those Tattoos"
2005 Eve Rita's stepmother Episode: "If the Shrew Fits"
2006 Criminal Minds Agt. Amanda Gilroy Episode: "P911"
2007 CSI: NY Melodee Constanza Episode: "The Ride In"
2007 Raines Angelina Billings Episode: "Closure"
2009 The Big Bang Theory Mikayla the Prostitute Episode: "The Vegas Renormalization"
2010 Lost Ava Episode: "Recon"
2011 Law & Order: LA Jenn Mackie Episode: "Angel's Knoll"
2012 The Finder Lisa / Mandy Episode: "A Cinderella Story"
2012 Castle Kristina Coterra Episode: "Cloudy with a Chance of Murder"
2013 The Exes Employee Episode: "Toy Story"
2016 Lucifer Ronnie Hillman Episode: "The Would-Be Prince of Darkness"
^ a b "Jodi Lyn O'Keefe Biography". Film Reference. Retrieved May 30, 2008. ^ "Jodi Lyn O'Keefe". Hollywood.com. Retrieved April 27, 2016. ^ a b "Jodi Lyn O'Keefe". TV Guide. Retrieved April 27, 2016. ^ John P. McCarthy (March 26, 1996). "Review: 'Nash Bridges'". Variety. Retrieved October 30, 2015. ^ Benedict Carver (March 9, 1998). "LL Cool J dresses up for 'Halloween'". Variety. Retrieved October 30, 2015. ^ Dennis Harvey (August 3, 1998). "Review: 'Halloween: H20 Twenty Years Later – Echo of a Scream, 'H20' Holds Water'". Variety. Retrieved October 30, 2015. ^ Lisa Nesselson (June 26, 2000). "Review: 'The Crow: Salvation'". Variety. Retrieved October 30, 2015. ^ Robert Koehler (March 26, 2000). "Review: 'Whatever It Takes – 'It Takes' More Than This'". Variety. Retrieved October 30, 2015. ^ a b Vanessa Torres (October 6, 1999). "O'Keefe is 'Teacher's Pet'". Variety. Retrieved October 30, 2015. ^ Godfrey Cheshire (January 27, 1999). "Review: 'She's All That'". Variety. Retrieved October 30, 2015. ^ Owen Gleiberman (February 5, 1999). "Movies - She's All That". Entertainment Weekly. Retrieved October 30, 2015. ^ Michael Schneider (October 10, 2005). "ABC builds 'Evidence'". Variety. Retrieved October 30, 2015. ^ Nellie Andreeva (June 19, 2007). "Newcomers in the can for Fox's 'Prison'". The Hollywood Reporter. Associated Press. Retrieved October 30, 2015. ^ Ilana Rapp (June 30, 2014). "Actress Jodi Lyn O'Keefe of VH1's Hit the Floor Talks About Her Q Jewelry Design". The Huffington Post. Retrieved October 30, 2015. ^ Mandi Bierly (May 5, 2014). "'Hit the Floor': Summer's sexiest promo has arrived -- EXCLUSIVE VIDEO". Entertainment Weekly. Retrieved October 30, 2015. ^ Samantha Highfill (July 17, 2014). "'The Vampire Diaries' adds Jodi Lyn O'Keefe and Marco James (Updated)". Entertainment Weekly. Retrieved October 30, 2015. ^ Gary Goldstein (August 22, 2013). "Review: 'Frozen Ground' fails to break the surface". Los Angeles Times. Retrieved October 30, 2015. ^ Phil Gallo (March 30, 1999). "Review: 'Happy Hour'". Variety. Retrieved October 30, 2015. ^ "2007-08 pilot orders: ABC". The Hollywood Reporter. Associated Press. April 4, 2007. Retrieved October 30, 2015. ^ Etan Vlessing (September 1, 2010). "Canadian thriller to air in 2011 on domestic pay TV networks". The Hollywood Reporter. Retrieved October 30, 2015. ^ Lesley Goldberg (October 3, 2012). "'Prison Break's' Jodi Lyn O'Keefe to Co-Star in Lifetime's 'Stalkers' Pilot". The Hollywood Reporter. Retrieved October 30, 2015. ^ "Whisper of Fear". myLifetime.com. Archived from the original on April 2, 2015. ^ "Development Update: Saturday, May 10 - Odds & Ends". The Futon Critic. May 10, 2014. Retrieved April 30, 2017. This page was last edited on 17 February 2019, at 16:35 (UTC).